This week the humanitarian and environmental disaster caused by Europe's use of asbestos took center-stage at a series of meetings attended by 150 delegates in Brussels, the de facto capital of the European Union (EU). On September 17 & 18, a conference entitled Europe's Asbestos Catastrophe: Supporting Victims, Preventing Future Tragedy was held at the headquarters of the European Trade Union Confederation. This meeting was the culmination of nearly two years of planning by a partnership of trade unions and asbestos victims' groups. The organization of this project was led by personnel from the European Federation of Building and Woodworkers whose efforts were assisted by representatives of the International Ban Asbestos Secretariat, the European Trade Union Confederation and the Belgian Asbestos Victims' Association (ABEVA); funding was secured from the European Union to enable this undertaking to proceed. 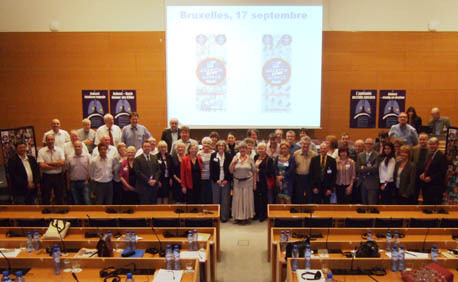 The provision of interpretation in English, French German, Dutch, Italian, Spanish, Polish and Hungarian facilitated communication amongst asbestos victims' representatives, trade unionists, academics, campaigners for non-governmental organizations and European Commission officials from 22 countries. The presentations, panels and discussion sessions provided the opportunity for information to be relayed and future initiatives to be explored. Asbestos meetings which had taken place in Brussels in 2001 and 2005 did so prior to the integration of several East and Central European states into the EU. As a result, the asbestos challenges faced by countries such as Bulgaria, Cyprus, Hungary, Malta, Romania and Slovenia had not been addressed. To remedy this oversight, particular attention was paid during the drafting of the conference agenda on the situation in these countries with an emphasis on those which are already in the European Union as well as candidate and potential candidate countries. Judging by the presentations made by delegates from Slovenia, Romania, Poland, Macedonia, Hungary, Albania, Serbia and Greece, there is a huge discrepancy by member states in their approach to the asbestos hazard. While Poland has set a deadline of 2030 for the asbestos decontamination of the country, Greece seems to be in complete denial regarding the existence of asbestos-related diseases amongst its citizens. Slovenia has implemented a proactive and up-to-date medical program for the identification of at-risk workers and the diagnosis and treatment of those affected by asbestos-related diseases while the Albanian Government does not consider that asbestos poses either an occupational or environmental threat. A full report will be compiled in due course discussing the specific presentations and interventions made during this event. 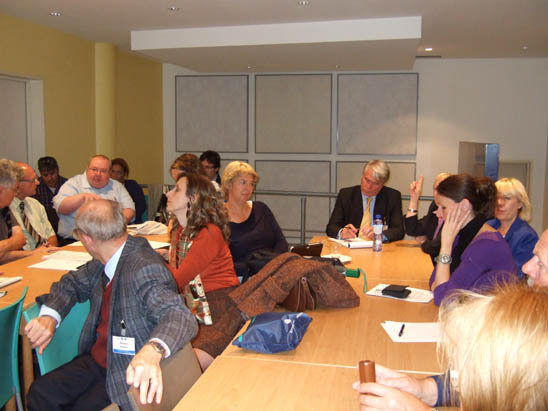 On the afternoon of September 18 a workshop was conducted, hosted by ABEVA President Eric Jonckheere, to begin work on a European Charter for Asbestos Victims. The lively discussion which ensued benefitted from input received from many of those in attendance including French colleagues who will be holding an International Day for Asbestos Victims in Paris next month (October 2012). 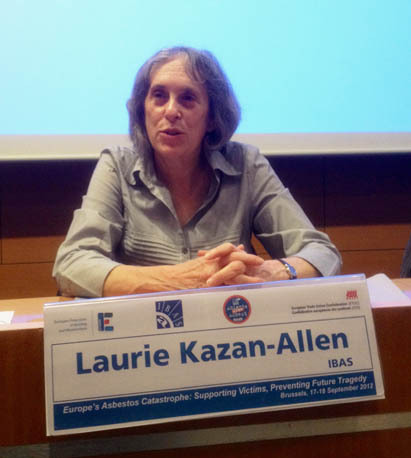 Laurie Kazan-Allen, Coordinator of the International Ban Asbestos Secretariat, UK. 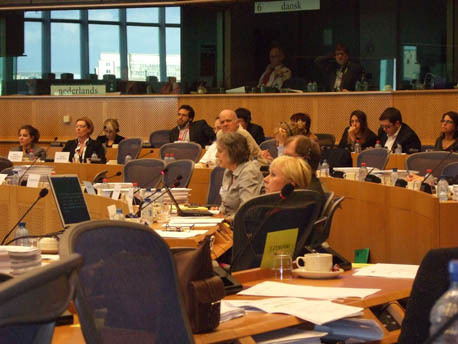 The asbestos hearing can be viewed online with interpretation in 20 languages on the European Parliament website.1 The asbestos segment of the Committee's meeting on September 18th began at 17:10 with a statement by MEP Stephen Hughes; the IBAS evidence began at 18:26.